Julie is the consummate ambassador for Changing Places. Meticulous and detail-oriented, but also utterly charming, Julie wins the heart of every client. She’s one of CP’s most versatile organizers, happy to be deployed in a cluttered garage or a beautifully remodeled kitchen. 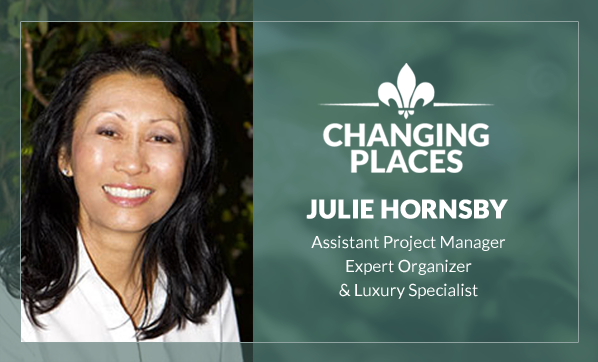 She comes to Changing Places with over 30 years of experience in customer service and hospitality, including years at the luxurious (now closed) Gump’s. She is passionate about finding the perfect home for our clients’ possessions, whether it’s consigning antique sterling silver or donating art supplies for local kids.